Just a few lights from a couple of homes in the area. As I have said, I appreciate space much more when I can actually see what's out there. Lights often obstruct my view in Florida. 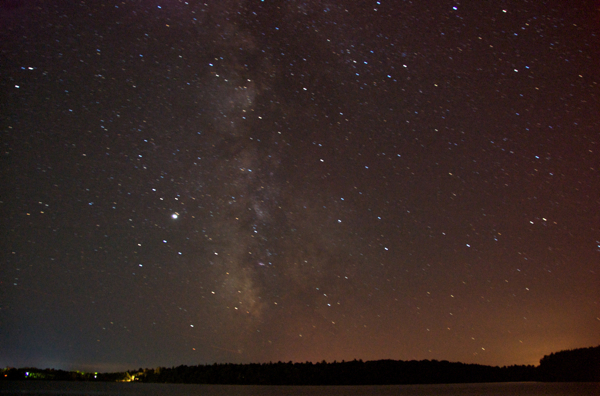 The skies in Maine, though, were pitch black tonight, so I snapped a few shots of the Milky Way. I planted my tripod in shallow water just off my parents' dock. By doing that, it eliminated motion from my footsteps. More importantly, it permitted me to shoot beneath some tree branches that would have been waving around in my shot. Actually, the tripod strategy was my father's idea, and I needed his permission to get it wet anyway because it is his equipment after all. This exposure is 74.6 seconds, and you can see some obvious movement in the stars because of Earth's rotation, of course. The graininess is caused by the high ISO (the film/chip sensor speed standard recognized by the International Organization for Standardization), which was 800 for this particular photo. That allows more light to hit the digital camera's sensor.